The November skies in SF are fairly full of construction cranes, not only high up in the skyline, but down below the sky level as well. SFcurbed.com just put out an updated Market Street section of its crane project interactive map, and its surprisingly rich in crane life. Here’s a peek at some of the projects literally coming up. Four hundred and nineteen new homes are being built as part of the 150 Van Ness building. 100 Van Ness is all done and gleamingly ready for business, whereas 150 is in the hole-in-the-ground state though Clark Construction is seeing “substantial completion” in February 2017. Now here’s the name of a real SF building: Arquitectonica. That’s right. Arquitectonia is the site of the newly constructed Trinity Place Apartments, with 2,000 units opening their doors soon. The overall Arquitectonia project is cavernous and involves four buildings, and features a swirling Venus statue as public art once the buildings are open. 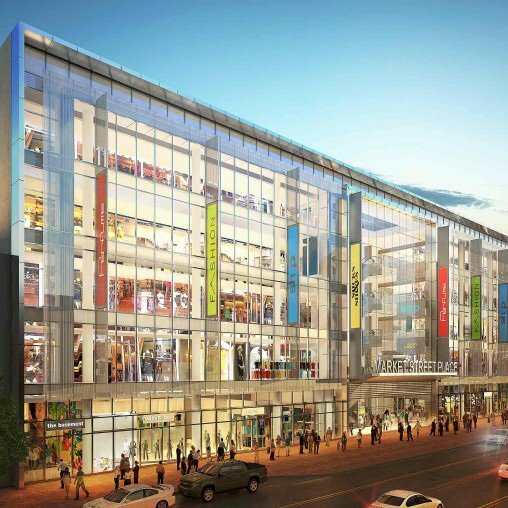 Switching over to retail space the long anticipated Market Street Place is a sprawling 375,000 square feet bazaar of stores, restaurants and entertainment spaces. The Place was supposed to open in “Fall 2106” which is now, but it is still a ways from the big reveal. Click here to see the whole Market Street Area Crane Map.